VancouverPolyClayers: Another Big Year Ahead ! Another Big Year Ahead ! Below is the copy I tried to publish last week but the Blogger Goblins seemed to be at work and I could not post. Sorry it is after the meeting but at least you have an idea of what we set out to do. Things seem a bit unstable over on our Yahoo Group site ,with the new Yahoo groups changes, so we will try to keep you up to date on our Blog. I must admit we have not been that active on here since our Horizons 2013 retreat but will be correcting that with regular posts. So stay tuned. This Saturday, Sept. 14 we will be doing an Autumn themed skinner blend. 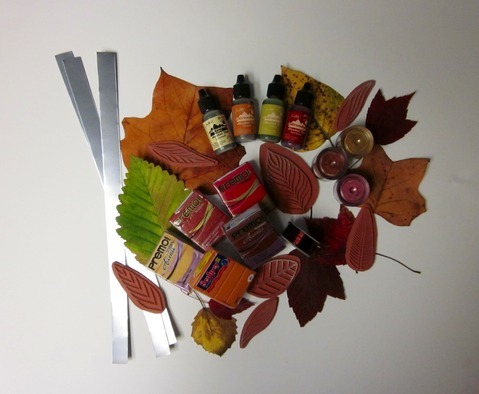 Some leaves and supplies we plan on using. For those unfamiliar with a Skinner Blend we will show you how and what colours of clay to use. Your blend can then be impressed and/or used to make Autumn leaves or other Fall jewelry or decorations. Our planned theme for the October 12 meeting is Halloween or Dia de los Muertos (Day of the Dead) giving you another chance to use your Autumn themed blend. If you have any questions please leave them in the ‘comment’ section.